It's been a while since we have gotten on the blog! But we have been hard at work finishing up construction and jumping right into hosting weddings. It's been a long journey but we are one month in already, with 5 weddings under our belts. That leaves 22 more to go this year! We have been blessed with so many couples who have put their faith into us and stood behind our journey. We can't wait to celebrate with each and every one of them this year and for many more years to come. It's just amazing how much the lower level has transformed! It has a rich, warmth feel with a little modern edge. Everyone comments on the floor and can't believe that it is concrete! Our contractor, Lorenz Concrete did an AMAZING job with their hand crafted rustic wood floor. Can't help but give them a plug (if your looking for an amazing wood look concrete floor you MUST give them a call). Now onto the upper loft. This is the main event space and although the transformation wasn't as dramatic, the elegant additions we added are so stunning! The largest project was the flooring. We installed maple floors on top of the original flooring. It was a three week project (one we did ourselves with the help of many family members!) and turned out amazing. The light floor against the darker wood structure is a great contrast. We added three large chandeliers and a few string lights just for a touch of that elegant look you want in your barn wedding. We also added two staircases, windows, and an elevator. The other big project was the landscaping. Although it doesn't look too different than it did before, the process was dramatic! The patio and fire pit areas are a highlight of the venue. Everyone loves to be outside on a nice summer evening, under the string lights and enjoying the sunset. We laid 30,000sf of sod and prayed for rain! Watering was a full time job for a few weeks but we managed to keep it all alive! We kept plantings to a minimum this year with plans to add more in 2019. The past two years where a whirlwind. We had many ups and downs, setbacks and surges forward. Our family and friends were a huge help throughout the way. We will keep the blog posts going, with weddings as the main focus! Thank you to all our followers and we hope to see you on the farm soon! We were granted our Conditional use permit at this meeting and pretty quickly afterwards, applied for our building, septic, and stormwater permits. 2. June 2- Building permits granted! After several months of designing we were granted the permits to begin the work! This included a new septic system, fire sprinkler system, parking area, and all the building remodeling. Starting in July we opened our 2018 calendar for booking. We wanted to be sure we would have enough time to finish our construction. We quickly started to fill our 2018 season! After looking at several construction companies, we decided on a local company- Lansing Remodeling. Working with Cameron has been a great experience. His carpentry stills are top notch- our unique barnwood walls and small details are noticed by all of our visitors! Most of our construction and remodeling was completed in the Fall/Winter, with a few items to go into the Spring. We are finishing up our upper loft floor this winter, completing the installation of the indoor pipes for the sprinkler system, and staining the concrete floor. Once the weather warms back up we will be doing some grading work in the courtyard to prepare for the patio installation in the Spring. Landscaping and seeding work will be completed in April. Today we are humbled to say we have 24 couples booked for 2018. We are so excited to share our space and create the perfect wedding for each of them. As we move closer to our first wedding over Memorial Day weekend we continue to prepare and plan for some of the next phases of construction for our 2019 season. In the spring of this year we were asked to participate in a styled wedding shoot. Being a new venue, we were very excited to be asked to do something like this! The styled wedding shoot happened in June and it was magical (cheesy, I know but it was!). We worked with so many great vendors to make the entire day a success. The best part was the theme had a southwestern flair- with cactus, macrame, and other really fun touches. This is not always the norm for a barn wedding but truly showcases how versatile this space can be! We are excited to share some of the images for you to see as well...take a look! We are just over the one month mark and there have been a whole lot of changes made! We have a new lower level floor with radiant heating, our bathrooms are framed out, and we have two new staircases! Although many find construction stressful, we must admit that this whole process has been exciting for us! Yes, some moments have been a little trying, but I blame that on never having done a project like this before! Ever since we started this process in April of 2016 it's been a roller coaster of emotions. We had successful moments and some major setbacks. 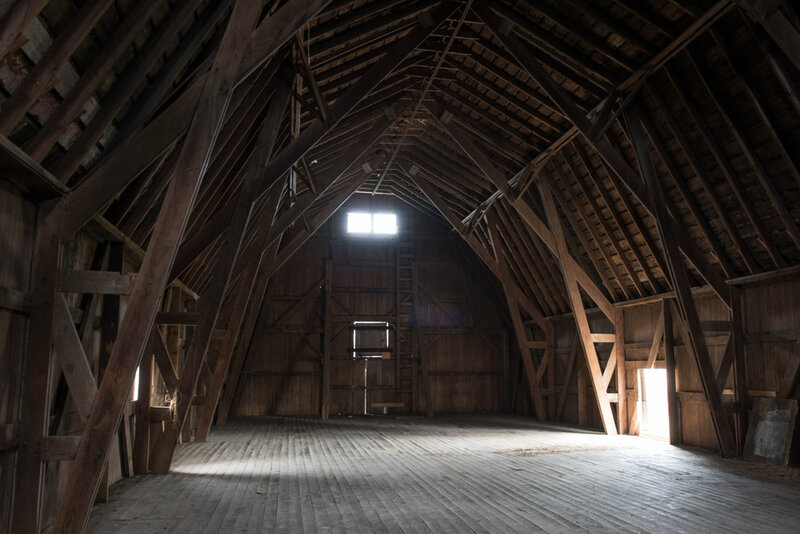 Just being at this moment of construction and transforming this wonderful barn into a wedding venue is a huge success for us and we are taking in every day. Along with a lot of structural upgrades, there are lot's of other changes that are harder to see. Electrical lines have been run in the lower and upper levels for the new lighting. Rough plumbing is in and we are getting closer to installing fixtures. Water lines have been dug from the barn well and water hooked up to the mechanical room! The next month we should see the wall's go up on the bathrooms and perhaps some of the fixtures being installed (at least they will be picked out!). We are gearing up to start the fire system install as well, with the pipes going in sometime in October. We have also decided to lay a new hardwood floor in the upper level- still deciding on what wood species and stain color! View of the upper loft coming up the new stairs. At this moment, we are going into 2018 with 17 booked weddings. We are so blessed to be working with such great couples who have seen our vision and will be the first to have their wedding at Bluestem Farm's De Graslanden Barn! Follow us on Instagram and Facebook for these updates! All the permits are up and contractors are scheduled! We are extremely excited to begin the remodeling process. The first step is the demolition of the lower concrete floor. We will be installing new wooden support beams in the process as well as prepping for all of the plumbing that will be laid down before we pour the new concrete floor. If you have visited our barn or have seen the many pictures of the inside, you will notice that the existing concrete is at different levels. We will be eliminating this, pouring a new floor all at one same level. We will also be staining and polishing the concrete floor a darker brown color! This will help limit the stains over the years and add the same warmth the barnwood already brings to the space! The old concrete floor and metal posts. Similar look to our new concrete floor! We have also started the demolition of the parking area outside the barn and taken down the original milk house. We plan on rebuilding this little room and house all of the fire sprinkler equipment inside. Eastern side of the barn, parking area. One permit down, one to go! We recently received our septic permit from McHenry County and hope to start the construction of a new septic field this month. This new septic field will only cover the restroom facilities for De Graslanden Barn. In about two weeks, we should get word back on our building permit! Our fire plans are now in the hands of a third party review team, so we have been waiting on that to come back approved! Although the process for getting the appropriate building permits has been long, we can't be more appreciate and excited for this adventure! We are so blessed to be here today on the heals of creating a beautiful space many couples and families will create lasting memories in. On a completely different note, we plan on having a fire pit for events. Here is one I have recently come across, what does everything think of this rustic fire pit? De Graslanden Barn...what does that name mean? The property has a rich history, much of which we are still trying to piece together. What we do know is that the property was first settled in the early to mid 1800's. The original farm house was used as a stage coach stop for travelers between Chicago and Rockford. The farm house burned down but the barns were spared. During the years, a few different families owned the property, including some who used De Graslanden Barn for Dairy farming. One family, in the early 1900's planted many of the trees on the property- dating them to over 100 years old! A very appropriate name as the property around Bluestem Farm is all restored prairie. Bringing the land back to it's original glory many of the early families enjoyed. We have come across many news stories about the area and will continue to gather as much historical information as we can. One of our favorite news stories we have come across involves the sighting of a lochness-type beast living in Goose Lake (the lake that sits next to Bluestem Farm)! We are happy to show everyone our new logo! A mix of contemporary elegance and a more fun, modern vibe- this logo really emulates our brand! 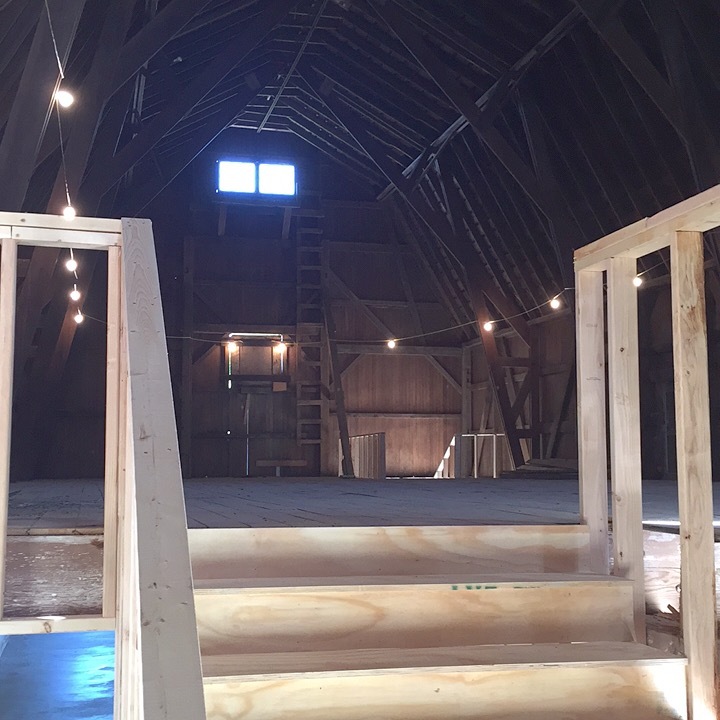 The bridal party will have a glamorous space to relax and get ready right inside the Barn. But this room is also very practical. The location- in the Loft of the Barn- will allow the bridal party access to the room during the reception as well- for those possible wardrobe changes, make-up touches and to safely store their personal items. Being a wedding photographer, I understand the need for a beautiful, bright, and clean space for getting ready pictures. Our brides are going to feel amazing in this room! I certainly know they are going to appreciate the gorgeous space when they get their wedding pictures back. Have any thoughts on The Bridal Quarters? Feel free to contact me! On Tuesday, Jan 17th McHenry County granted Bluestem Farm the permits needed to operate! After a year of hard work, Bluestem Farm was approved during the January 17th McHenry county board meeting. That means we have been approved to hold events on our property! The next phase is construction, which will commence in just a few short weeks. Throughout these next months, we will continue to update our clients and the community about our progress. Our next exciting announcement will be our new logo! That will be completed soon and unveiled next week.